Arrival Review | Nerd Much? 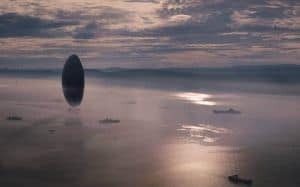 There have been a lot of science fiction movies released over the past few years that have aimed for the big blockbuster style of just throwing aliens and wild technology onto the screen hoping it’ll work. While we have had a few smart sci-fi TV tales pop up, namely HBO’s Westworld, it has been rare for the film industry to get one right. While we have made attempts with the likes of Morgan, Lobster, and Tell Me How I Die, rarely do all the pieces ever come together in a coherent fashion. 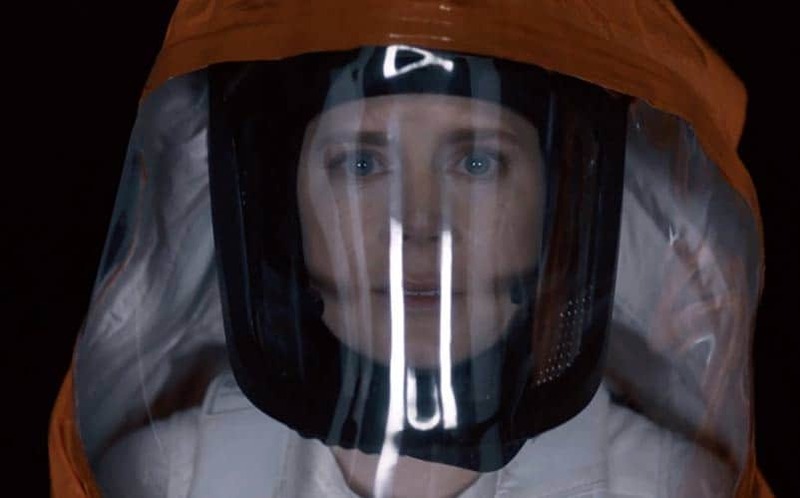 Thankfully, director Denis Villeneuve’s Arrival has brought together some of the best elements from the genre, even if it gets lost in its own ideas halfway through. The story this time around follows Dr. Louise Banks (Amy Adams) who is one of the best linguist teachers in the entire world. Soon after the film starts several alien spaceships land around the world at seemingly random points on the map, causing both panic and fear from the general populace. The catch is that once a day these ships open and allow humans to speak with them for a set time period. However, since no one can understand them it’s up to Dr. Banks to figure out what they want and what’s their purpose on Earth. Right off the bat, it’s clear that Villeneuve is going for a far more grounded, dare we say realistic approach to how nations would react if a bunch of spaceships just appeared out of nowhere. There’s a lot of political red tape, backstabbing, news shows fear mongering, and families acting generally wary of these creatures. It’s oppressive in design, yet remains refreshing from the sea of “aliens invade and blow things up” concept. We rarely get to see how humans would realistically react because it just doesn’t make an exciting film experience. This is subverted by the fantastic performances and specifically Dr. Banks’ character arc. It’s rare in film that we get a character that is extremely flawed and yet somehow doesn’t turn into a parody of themselves. Make no mistake Louise is a brilliant woman, but she’s haunted by memories of a tragedy that cause her to break down in multiple fits of hysteria. This is never really played off as comical and it serves to make her feel far more vulnerable, even when the aliens don’t appear to be hostile at all. Her problem isn’t external, it’s internal which is not common when big extraterrestrials are the centerpieces. This is all complimented by a fantastic performance by Adams, who comes off as both likable and tragic. You want her to succeed, but Adam’s does a fantastic job of making the audience unsure of her sanity. Banks is always pushing the boundaries of what she’s allowed to do, but this is never played off as her “just being a rebel.” Instead, she’s obsessive and it makes Banks an incredibly interesting character to watch, especially once the third act rolls around. In terms of the rest of the supporting cast, they all do admiral jobs, with Jeremy Renner’s Ian Donnelly standing out among the rest as Banks’ cohort. The duo has good chemistry, but sadly characters like Colonel Weber (Forest Whitaker) and Agent Halpern (Michael Stuhlbarg) just don’t have enough screentime to make a full impact. This wouldn’t be an issue if the movie wasn’t so intent on including them in virtually every discussion about the aliens, which only highlights their glaring lack of development. As for the actual aliens themselves, well they’re interesting to look at and aim for that Signs “Less is More” approach. It’s cool when it needs to be, but when you see them up close they are pretty ridiculous looking and it kind of removes the mystique that they’ve been building up. However, the biggest problem with Arrival actually has to do with its big third act twist that is meant to make you question everything. We are treading deep into spoiler territory so you’ve been warned. Okay, so it turns out that those flashbacks about her daughter dying that’s plagued Banks from the beginning are actually visions of the future. The aliens perceive time differently than us and are looking to gift this to humanity so they can see the future (because that definitely wouldn’t go downhill fast). The idea itself is sound and acts as a good “Oh I gotta go back and watch it again!” concept, but it actually ends up undermining Louise all together. Up until this point her biggest asset was deciphering parts of the alien language and in one move they literally just give her all the knowledge. This effectively makes all of Louise’s work up until this time basically useless and it just feels like a weird choice on the director’s part. Louise doesn’t even need to solve any real clues or face any big challenges once she has this power, which feels wasted. I get this was supposed to knock everyone out of the park and at the time of seeing it I was. However, once you leave the theater and begin to think about it, the entire plot comes falling apart. Arrival is a film that is both emotionally tormenting and insanely frustrating at the same time. While Adams delivers a truly gut-punching performance that will have you reaching for tissues by the end, it’s the director’s twist that throws it all into chaos. What could have been a cool moment instead falls flat on its own pseudo-science and need to explain every detail of how everything is possible. Yet, that doesn’t make Arrival a bad film, in fact, it was rather enjoyable and we still recommend it. Let’s just hope if aliens end up landing they are this type and not the ones from Mars Attacks!